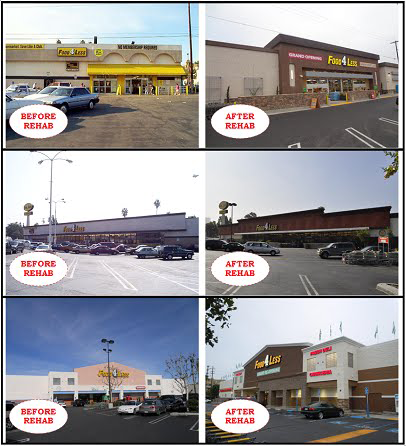 This project entailed the interior and exterior rehabilitation of four Food4Less stores located in distressed communities within the City of Los Angeles. The work will improve community access to fresh, healthy food in areas that are direly in need. The combination of the investments funded by Kroger and the additional NMTC investment made each store an even more desirable shopping option, further strengthening their relative neighborhoods. The investment of New Market Tax Credits in the Food4Less transaction protects union supermarket jobs, creates quality retail shopping venues for local low-income residents, improves the physical appearance of the community, augments current efforts to improve targeted neighborhood commercial hubs, and boosts the City of Los Angeles' efforts to ensure access to quality, healthy food for under served communities. The rehabilitation of these four stores helped create and retain close to 300 jobs, at least 2/3 of which represent union employees, in communities that are suffering from high unemployment or underemployment. All employees qualified for a full benefits package. Food 4 Less emphasizes local hire for all positions, including higher management positions. Kroger committed to using the City of Los Angeles WorkSource Centers, full service employment program operators administered by the Economic and Workforce Development Department, to list all job openings ensuring employment to local community members.